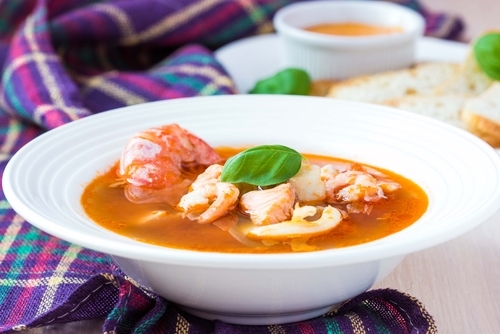 If using frozen seafood, thaw it in the refrigerator for several hours or overnight. Once thawed, store in the refrigerator, well wrapped and sitting on a bed of ice (just as you should for fresh fish). When fresh clams are unavailable, try using the frozen steamer clams available at Trader Joe's. If you have it, a pinch of saffron threads or a sprinkle of ground saffron beautifully enhances this main-course soup. 1 If using fresh tomatoes, heat the broiler to high; put tomatoes on a foil-lined baking sheet. Broil 6 inches from the heat source, turning occasionally, until the skin is lightly charred on all sides, 10-12 minutes. Cool, peel and chop coarsely, collecting all the juices. 2 Heat the oil in a 4- to 5-quart Dutch oven or deep saucepan. Cook the shallots and leek until soft, about 4 minutes. Stir in the red pepper and garlic; cook 1 minute. Add the tomatoes, broth, clam juice, wine, tomato paste, salt and smoked paprika. (This base can be refrigerated, covered, up to 3 days. Shortly before serving, heat the tomato mixture to a simmer.
) 3 Add the clams; cook 3 minutes. Add the shrimp and fish; cook 2 minutes. Add the scallops; cook 1 minute more or until all fish is opaque but still tender. Ladle the soup into wide serving bowls. Place a dollop of the garlic mayo into the center. Sprinkle with parsley and chives. Garlic mayo: Mix 1/3 cup mayonnaise and 1 tablespoon fresh lemon juice in a small bowl. Use a garlic press to crush in 1 large clove of garlic; mix well. Add a pinch of salt if needed. This can be made up to 1 day in advance; cover and refrigerate..